When it comes to reaching and engaging audiences, video content reigns supreme. The numbers speak for themselves: according to The Drum, YouTube viewers watch a billion hours of video each day, while Facebook users consume over eight billion videos every day. And all those hours spent consuming video often lead to tangible outcomes: a recent report by Impact found simply mentioning the word ‘video’ in an email subject line increase click-through rates by 13%. A common perception is that charities often struggle to respond to industry trends as quickly as brands, but in our 10 years working with over 30 charity clients, we’ve found this delay can usually be attributed to a lack of resources, rather than a dearth of creativity or desire to invest in boundary-pushing video content. Indeed, many organisations in the third sector are increasingly keen to invest in video, and are actively pursuing the best ways to do so. Even without a strategy in place, the majority of charities we surveyed are seeing the benefit of video content – nearly 74% of respondents said they are seeing return on investment when choosing video content. And a whopping 95% said they see video content playing more of a role in their organisations in the coming year. But the ambition of organisations isn’t always being met with the support and financial resources needed to achieve their goals. 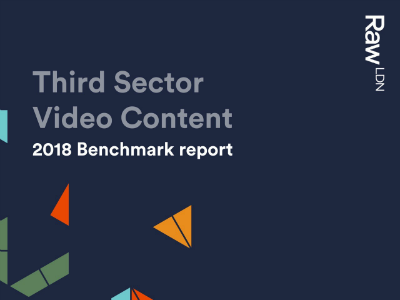 Part of this gap can be attributed to a lack of overall alignment within organisations themselves – just 9% of respondents said “video is well integrated” across their charities. As such, it appears a more formal commissioning process and universal understanding of production is required across the board in order for organisations to be using and fully benefiting from the medium. We’ve observed many organisations that don’t know where or how to start when designing a long-term content strategy. It can appear an insurmountable challenge; a pursuit reserved for the big players. But, as with most endeavours in digital, it’s about stripping back and starting small – testing, tracking, improving and then constantly repeating as the strategy grows in scope, confidence and effectiveness. Encouragingly, 74% of respondents agreed that video is “more effective as a primer for direct fundraising”, rather than making the ask with the video. A great example of this is #EscapeRobot, the campaign we produced for War Child UK to bring to life its policy report on mental health and psychosocial support for children affected by war. The video is designed to drive new audiences to visit a microsite dedicated to the report and take viewers on a journey continued and developed through an email campaign. The campaign journey uses additional videos featuring War Child beneficiaries, and eventually results in a fundraising ask. Overall, the campaign’s ‘nudges’ have proven to be remarkably successful: while final fundraising results have yet to be tallied, the video has done very well online, with over 1.5 million views, and the landing page has seen an average dwell time of 15 minutes over the course of three months – thanks in large part to the video’s emotional heavy-lifting in turning a cold audience in to a warm and even hot one. Start with a strategy. Map out your content aims for the twelve months ahead. Thinking long-term will help you match your ambition to your strategic goals, and will produce better outcomes. Ensure all your stakeholders and teams are on board with your content strategy. This will help streamline the process and avoid miscommunication. Have the courage to test, test, test – use all available research methods to your advantage! We hope our survey will help UK charities benchmark their own performance, and provide both reassurance and inspiration for the years ahead. Download Video content in the third sector here. Ryan founded Raw London over 12 years ago and is passionate about taking a strategic approach to video content. With more than 20 awards to his name, Ryan is considered an expert in content marketing strategy and is a regular speaker at industry events across the world. Fiona has over five years of communications strategy experience in the social sector, having consulted for leading innovators with the global nonprofit Ashoka in Ireland before joining Raw London. She is a graduate of the LSE’s Media & Communications Masters programme. Charlotte is a qualified marketing specialist with over 5 years experience across non-profit, B2B and B2C sectors. She specialises in digital and content strategy, working closely with clients at Raw London to make sure their campaigns reach as far and wide as possible.